Now I will describe a very interesting and simple meditation. It is the ‘Zen’ Meditation. The ‘Zen’ is the word used in Eastern World (of Tibbet, Japan and China) for ‘Dhyan’ or Meditation. This Zen meditation is the methods of Zen monks who just be still and know. 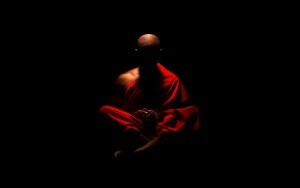 If you just sit still & empty, you will be doing Zen meditation. I will tell you how a lay man can do it. The main thing is how to be still and empty from inside ? Zen meditation is the technique which gradually takes us to the state of absolute stillness and emptiness. However it takes some time to master it. Nevertheless, it is one of the most easiest and effective meditation technique. Before starting Zen meditation it is essential to understand some important things about our mind. Our mind (whose physiological counterpart is Brain ) is consist of two parts- left and right mind (brain). Both these two left and right parts give rise to different creative urges in us. The left Brain takes care of logic, theology, philosophy, math and science etc. Sit in the lotus pose (cross legged) keeping your spine straight. put your hands on each other in your lap. Inhale again…… deeply….. Count three…. Continue this deep breathing and count up to ten..
Now keep inhaling and exhaling after ten…11….12…13….but make your breathing normal (that is don’t take deep breath. Just continue counting and breathing normally). Don’t take deep breath. just breath in a normal way. If in between the counting, you forget counting….start again. Do these inhalation and exhalation for half an hour. Now again inhale and exhale one more time deeply. your meditation is complete. ?????? Do the above meditation process for one week. just inhale and exhale for half an hour in lotus pose after activating your right mind by using the procedure described above. For one week just do this. ..
Now make some modification in this meditation. The process will remain the same but now instead of counting both inhalation and exhalation, just count inhalation. It means fist of all inhale and exhale deeply while counting up to ten. Then restore normal breathing and count only inhalation as 11, 12. …. so in. Do this for one week. Just sit . Just sit in the lotus pose. Neither count nor inhale or exhale. The breathing will go on itself. But don’t be aware of the inhalation or exhalation. Sit silently. Be aware of the moment. Be still. You’ll be in state of Zen. The state of absolute stillness. The state of just sitting.